U-Reach Data Solutions Inc.: Why do you need double source comparison? Why do you need double source comparison? U-Reach Intelligent 9 golden series of USB/SD & MicroSD/CF flash duplicator is equipped with a unique function called DSC (Double-Source Comparison). must use this precise DSC function to meet their requirements. They need to copy critical content –GPS navigation map, into both SD and MicroSD card with hundred to thousand pieces per day. This is the most important issue in their duplication task. Is how to guarantee data copy with precision? The feature adds an extra layer of protection to prevent source data corruption from long-term operations and susceptible to copy errors that will affect all copied targets. The principle of the double source comparison. l Users who copying critical data (i.e software)- it is strongly suggested if you are copying critical data. l Users who use the duplicator frequently, the socket will wear out quickly. l Users who use the same source memory card when coping large quantities. Tips! How to guarantee data copy with 100% accuracy? (2) Test data sample on device, double check if copy process is 100% accurate. 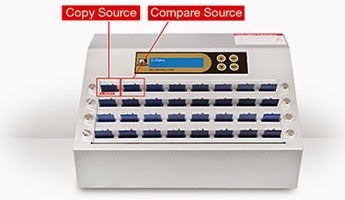 Labels: double source comparison, micro sd duplicator, sd duplicator, usb duplicator, verify .